Determining which items to purchase based on what we had in the school, interests of students and staff input. Determining costs and working within a budget. Identifying which items would work best within specific areas of our playground. The dialogue they had in class was grounded within a real life, and meaningful context to them as students. The students themselves came up with many ideas. Here, the students developed surveys to collect data from each class on what students felt we needed for materials. 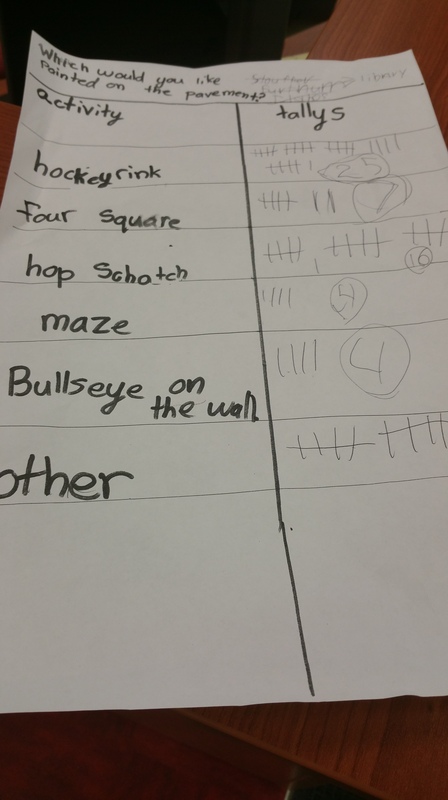 With any survey comes data that the students then tallied in charts. Students themselves realised that they needed to present the information in a more concrete way. 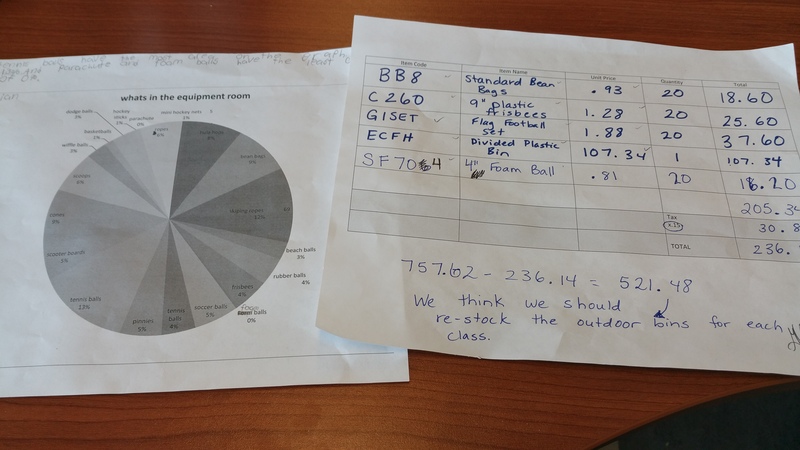 Here, a class can be seen graphing their data to present for further discussion. Such exploration is something that aligns with the Data Management and Probability strand of our mathematics curriculum. Then, came the planning around how to spend the budget amount I provided them. 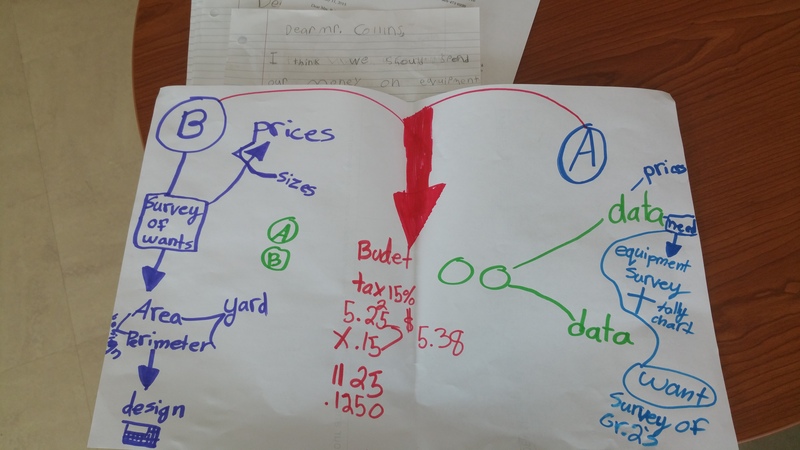 When it came to the bottom line, the students worked hard to determine how much they could spend that would allow for the ideal purchasing. They discovered how they had to multiply the cost per unit with the total number of items they needed. And yes, they discovered something called tax that had to be added to their overall amounts. Over the course of this investigation, students focused on the area of Number Sense and Numeration in class. Another dimension to this inquiry was that our School Council has been working with us on a plan for line painting for our school. We used this as an opportunity for students to share their ideas around what designs would work best. 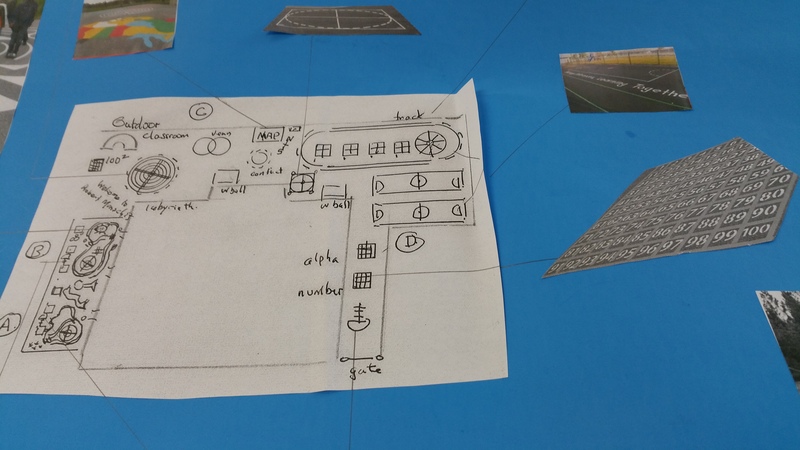 They had to consider the area and perimeter of our schoolyard carefully when selecting the items to be painted. The students then presented their ideas to a school council member for consideration. We’re happy to report that some new items have indeed been purchased for our gym. 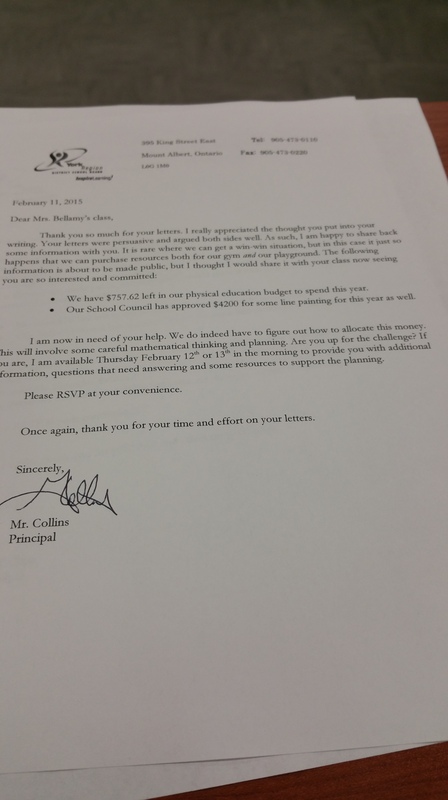 The students did such a good job staying within the budget, that we had extra money left over! We decided to use this to purchase more items for our recess bins that classes us for outdoor play. So what did I learn as principal of the school through this journey? Lots. 1) Students who write for authentic purposes end up writing a lot and are passionate about expressing their ideas. 2) Math grounded in authentic, real life contexts also encourages students to engage deeply in math. 3) Our math curriculum is rigorous. Over a few short lessons, students had to use different math skills within different strands of math. Helping students see how these skills are interconnected is important. 4) Our staff are engaging students in rich questions each day. 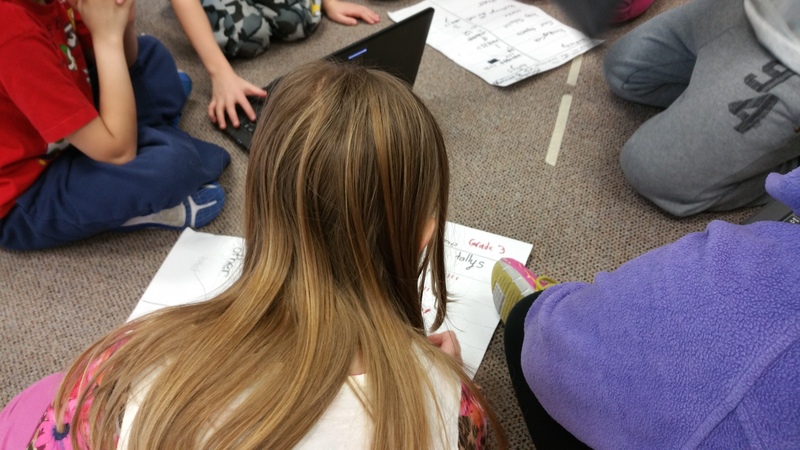 What began as one writing task evolved into a math inquiry through the teacher’s use of questions in the classroom and an inquiry based learning approach. At home, you too can find authentic ways to engage your child in math. We would love to hear about your journeys. This entry was posted in Inquiry, Numeracy. Bookmark the permalink.